ROME (CNS) — For some 25 years as pope, St. John Paul II would invite people to his table each day — sharing breakfast, lunch, dinner and conversation with a wide variety of cardinals, bishops, theologians, writers and friends. 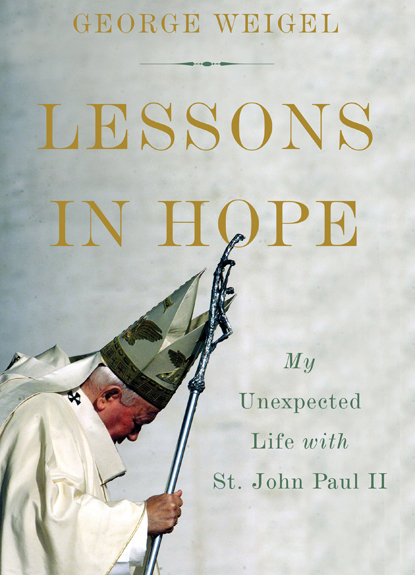 George Weigel, the author and scholar, was one of those guests on dozens of occasions and it was over a meal that he asked Pope John Paul the questions that form the core of “Witness to Hope: The Biography of Pope John Paul II,” published in 1999. The meals and conversations continued, providing information for the sequel, “The End and the Beginning: Pope John Paul II — The Victory of Freedom, the Last Years, the Legacy,” published in 2010. His last dinner with St. John Paul was Dec. 15, 2004. Interviewed in Rome Dec. 12, Weigel said he decided “to tell the story of our conversations,” which took place over a dozen years. But for that to make sense, he said, he also had to write about events and experiences in his life that prepared him to understand the history, philosophy and theology discussed around the table. Of course, he said, the conversations also included both lighter moments and personal ones, such as when Pope John Paul asked how Weigel’s mother was doing after his father died. “The table rather than the desk was his favorite point of encounter,” the author said. The conversations gave the pope different points of view on the situation of the church, on issues of theology and on political and social realities around the world, Weigel said. But, he said, at the same time, friendships were very important to him and he made sure to nourish them at the dinner table.